The 10-Gallon DC-Powered Watering Cart (WC-HYDRO-DC-KIT) provides ample water to industrial forklift batteries when mobility is a must. This compact tank can be pulled by hand and is powered from a built-in rechargeable battery. The large, capped opening simplifies refills, and the included BHS Water Gun attaches to a 9-foot output hose. For maximum performance and full battery lifespans, it is essential to maintain proper electrolyte levels in all battery cells. 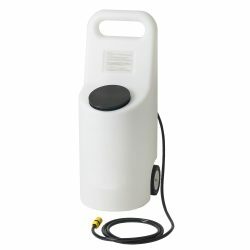 The 10-Gallon DC-Powered Watering Cart makes this task easy by giving staff a fully mobile and easily maneuverable water cart. Water is dispensed through an ergonomic dispenser, which allows staff to keep a safe distance from the battery. When electrolyte reaches optimal levels, an automatic shutoff stops the flow of water. Make battery watering faster, safer, and more precise with an ergonomic Watering Cart from BHS. Contact our sales team at 1.800.BHS.9500 to learn more about how Watering Carts and other Battery Watering Devices can help your forklift batteries last longer.